According to the wave model, linguistic changes spread outward concentrically as waves on a pond do when a stone is thrown into it, becoming progressively weaker with the distance from their central point. Since later changes may not cover the same area there may be no sharp boundaries between neighboring dialects or languages; rather, the greater the distance between them, the fewer linguistic traits dialects or languages may share. ・ Schleicher, August. Compendium der vergleichenden Grammatik der indogermanischen Sprachen. Weimar: Böhlau, 1861--62. ・ Schmidt, Johannes. Die Verwandtschaftsverhältnisse der indogermanischen Sprachen. Weimar: Böhlau, 1872. It was the great merit of Schmidt's wave theory to provide a visual scheme, entirely different from the family tree, which could plainly and correctly account for the overlapping of isoglosses and explain inconsistent partial similarities. If it is true . 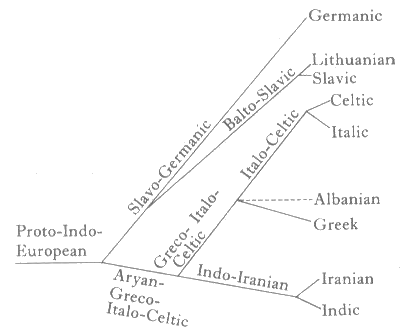 . . that the family tree and the wave diagram are usable not for the illumination of uncharted areas but merely for the illustration of the known or what is believed to be true, that they are representations of our two primary methods of investigation in accord with the principal types of linguistic differentiation, that they are complementary and no more exclude one another than do comparative linguistics and dialect geography, then it may be agreeable to use both types of visualization of linguistic processes as legitimate didactic devices, though always with due warning as to their figurative nature and their impermanence in the face of new discoveries and insights. ・ Pulgram, E. "Family Tree, Wave Theory, and Dialectology." Orbis 2 (1953): 67--72. Different linguistic changes may spread, like waves, over a speech-area, and each change may be carried out over a part of the area that does not coincide with the part covered by an earlier change. The result of successive waves will be a network of isoglosses . . . . Adjacent districts will resemble each other most; in whatever direction one travels, differences will increase with distance, as one crosses more and more isogloss-lines. 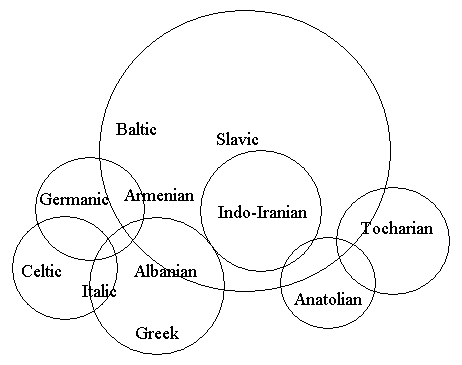 This, indeed, is the picture presented by the local dialects in the areas we can observe. Now, let us suppose that among a series of adjacent dialects, which, to consider only one dimension, we shall designate as A, B, C, D, E, F, G, . . . X, one dialect, say F, gains a political, commercial, or other predominance of some sort, so that its neighbors in either direction, first E and G, then D and H, and then even C and I, J, K, give up their peculiarities and in time come to speak only the central dialect F. When this has happened, F borders on B and L, dialects from which it differs sharply enough to produce clear-cut language boundaries; yet the resemblance between F and B will be greater than that between F and A, and, similarly, among L, M, N, . . . X, the dialects nearest to F will show a greater resemblance to F, in spite of the clearly marked boundary, than will the more distant dialects. The presentation of these factors became known as the wave-theory, in contradistinction to the older family-tree theory of linguistic relationship. Today we view the wave process and the splitting process merely as two types --- perhaps the principal types --- of historical processes that lead to linguistic differentiation.